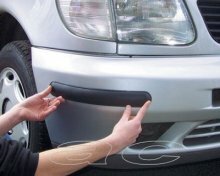 Richbrook Bumper & Paintwork Protectors hide Existing scratches and prevents damage. Very squidgy hi-elastic impact cushioning. Easy fit - self adhesive. 2 x Black Protectors & Cleaner Wipes Included. Car wash proof.